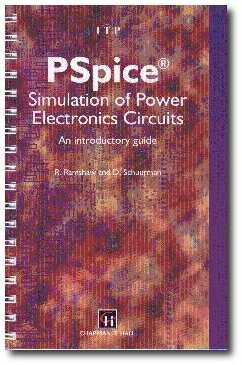 PSpice Simulation of Power Electronics Circuits is the title of a book by Raymond S. Ramshaw and Derek C. Schuurman which is currently published by Springer (formerly by Chapman & Hall). 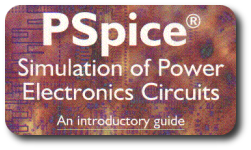 The aim of this book is to provide instruction in the use of a computer program called PSpice that can simulate power electronic circuits. This book was conceived as a result of research performed at the University of Waterloo in Waterloo, Ontario, Canada. The student version of PSpice is available here. There are also a number of "open source" Spice-based simulators such as Ngspice, but the examples in the book have not been tested with any of these. LIBFILES.ZIP - Options and Library files (20 kbytes). EXAMPLES.ZIP - Example circuit files (72 kbytes). EXTRA1.PDF - Extra Material (Part 1) for Chapters 1-4 (210 kbytes). EXTRA2.PDF - Extra Material (Part 2) for Chapter 5 (354 kbytes). EXTRA3.PDF - Extra Material (Part 3) for Chapter 9 (325 kbytes). EXTRA4.PDF - Extra Material (Part 4) for Chapter 10 (179 kbytes). Download the above files by simply clicking on them. Place ZIP files in a clean directory and extract the files by using an "un-ZIP" program. Next, use a text editor to read the README.TXT file which is included. This file will provide further information. The PDF files can be viewed using a freely available PDF reader such as Adobe Acrobat Reader. Instructors may obtain circuit file solutions for Drill Exercises and Problems by sending an e-mail request. Instructors may request inspection copies of the text by contacting the publisher. The information here is intended for educational purposes only and is provided strictly "as-is". PSpice is registered trademark of Cadence Design Systems Inc. The authors and publisher specifically disclaim all warranties, express or implied including, but not limited to, implied warranties of merchantability and fitness for a particular purpose.